A suave design Palmer is chic and sophisticated. The etched glass is enveloped by the organza shades which are finished in brown trim. 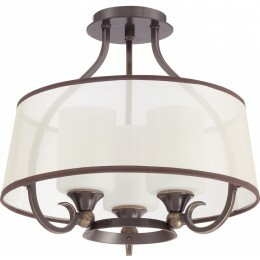 The versatile Palladian Bronze finish coordinates well with many home decors. The Quoizel PLR1716PN Palmer collection Close to Ceiling Lighting in Palladian Bronze uses Fluorescent light output and brings Traditional style. This item is 14.5"H x 16"W x 16"L. The wattage is 100. The Quoizel Lighting PLR1716PN requires 3 bulbs (not included). Additional Information: Shade-Glass, 2. Light Amber Organza Shade.